Iceland is a bit out of the way for a Europe trip that had previously covered the Balkans from Istanbul to Zagreb, the heart of central and western Europe and the UK, but it’s been Habiba’s dream to go there for a long time, so it was duly scheduled for the penultimate country in our Grand Tour. We flew into Keflavik, the country’s main international airport, then took a bus to Reykjavik, the capital, where we spent the night at Reykjavik Backpackers. 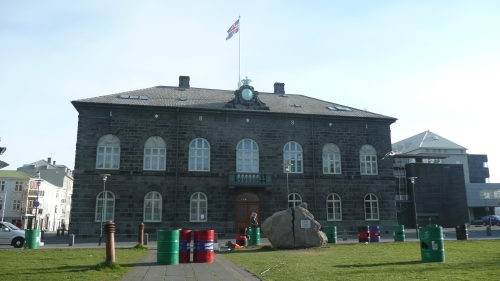 Iceland has a population of just 300,000, most of whom live in and around the capital. It’s a pretty modest place. There’s little historic architecture of the sort that we’d seen in every other stop along the way. The most important old building, perhaps, was the parliament – which looked like a large, old, stone cottage. 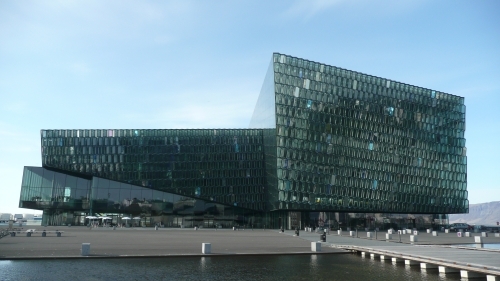 There was also a grand modern building – a concert hall called the Harpa, a post-modern honeycomb confection. Most of the the ordinary shops and houses were faced with corrugated metal – some of them were quite attractive, but it’s not the classiest of building materials. We explored a bit and went to bed. Sleep did not come easily: it was a holiday the following day, so lots of people were out drinking – something Icelanders do a lot – our hostel was on one of the main shopping streets, so it was pretty noisy; also, being so far north, the sun doesn’t set far below the horizon in the summer, so it didn’t get darker than early twilight at any point of the night. In the morning, we left the hostel and walked to Reykjavik Airport (we’d enquired at the bus station the previous day about getting a bus, but the holiday schedule was quite sparse). It was closed when we got there, but someone opened the small airport up within a few minutes. We got on a small passenger plane for our flight to Egilsstaðir (the ‘ð’ is a an eth, a voiced ‘th’; however, the ‘g’ is silent and the last two syllables are run together so it sounds like ‘Aylstathr’), a town in the east of the country. Once there we waited for the farmer at whose farm we were to volunteer at for the next two weeks to pick us up. We waited. And we waited. On a second attempt to call him, over two hours after we arrived, Habiba spoke to him and discovered he’d forgotten that we were coming. Not long after, he came and got us and took us to his farm a few kilometres to the south, Vallanes (double L in Icelandic is a bit like that in Welsh, but it sounds more like ‘tl’; thus, Vallanes sounds like ‘Vat-lan-ess’. On the ride, we passed areas that had large stands of young evergreens growing on them. I asked Eymundr, the farmer, about them and he explained that they had been planted as part of a government initiative since the 1980s and that he’d planted a million trees. 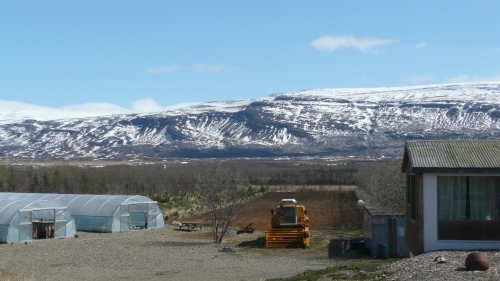 I later learnt that the saplings had been imported from across the Arctic Circle – from Norway, Canada and Siberia. The farm specialises in barley, but grows various other crops, too; it produces its own line of organic foods – Móðir Jörð (Mother Earth) – which, we discovered, are quite expensive. It’s not a big farm and there are only four members of staff – the farmer and his wife, Jói (‘Yo-i’) – an Icelander – and Dagma – a German. 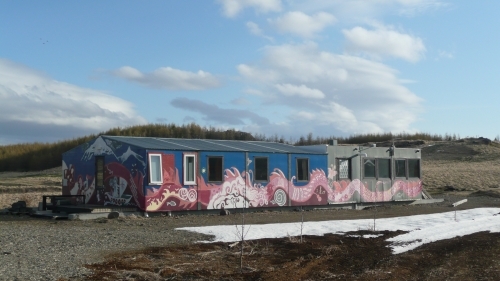 The latter two live in a couple of welded-together prefab huts known as the Monster House because of the sea serpent painted all around its exterior walls. Volunteer workers live in the same place. Habiba and I shared a small room with a bunk bed, a table, two chairs and a wardrobe; there were maybe half a dozen more such rooms, along with two or three bathrooms, a kitchen-dining-common area and Joi’s room. Volunteers like us generally go there because of an organisation called WWOOF – Wordwide Opportunities on Organic Farms. They have a set of global and national websites that people sign up to for a moderate fee and get access to details of various participating farms. WWOOF has no active participation in the arrangements people make. We worked six days a week at Vallanes, officially from nine to five, but the working hours were fairly relaxed, and included a lengthy coffee break in the afternoon. We got room and board – cooking and cleaning were done on a rota basis. There was one desktop computer with internet access. The farm was not terribly big – there was the farmer’s house, a small factory unit called the White House, a few greenhouses, a few small fields, a barn with more food producing equipment and a hen house, and the Monster House. Apart from the regular staff, there were several volunteers at any one time: Natasha from the UK, Isabel from Switzerland, Dylan from the US, Laurent (‘Lo’) from France, Yoko from Japan, Maria from Spain, Guillaume from Quebec, Mihaela from Italy and so on. 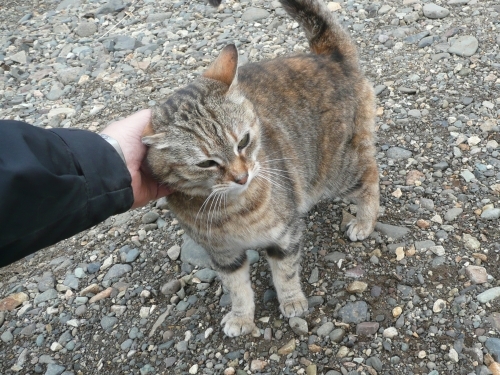 The personnel was rounded out by the farm’s cat, Susan (or Aphrodite, depending on who you asked). She was a smallish animal with very soft fur; sometimes she would come and check out what we were doing, approaching us for strokes; she let me pick her up without much complaint. Other times, we wouldn’t see her for days. The farm was also a hotspot for birds, especially a particular species that often flew about emitting a soft, low kind of beeping call: buh-buh-buh-buh-buh-buh-buh-buh. Our work mainly involved looking after seedlings: for several days, we pricked them out of seed trays and planted them up in trays consisting of individual pots – beetroot and kale were the main crops involved. They also took a lot of watering, and this was nearly a full-time job for one person (I did it a couple of times). The greenhouses were long, arched metal structures covered with plastic sheeting; the weather was often very pleasant and, inside the greenhouses, it got very hot. A big task at the end of our two weeks at the farm was making veggie burgers. This involved mashing up beetroots and potatoes, feeding the mixture into a patty-making machine, dipping the burgers in to an oat mix then boxing them up. Manning the burger machine was a fun challenge, as it popped out one patty every couple of seconds and you had to catch it and put it on a tray, building up as many as three layers of burgers until the oat mix dippers swapped the tray out for the one they’d just finished. Other random jobs involved weeding, cutting down some some small fallen trees, mowing, removing the sheeting from a greenhouse and preparing it for a new covering, moving things around, cleaning a minibus (I did this all by myself – it was full of soil) and general cleaning and helping. On our first Sunday day off, Habiba and I went with Dagma to the public baths in Egilsstaðir. I wasn’t too excited about this – swimming is not something I long to do; I had to borrow a pair of Bermuda shorts from the Monster House wardrobe o’ random clothes. It was actually a pleasant experience, though. Entry cost 500 kronur – about £2.50. The weather was sunny, but cool – which is relevant, because it was an open air swimming pool. There was a main pool, a paddling pool that had warmer water and was a very popular place to hang out, two hot tubs and a water slide. There weren’t many people there and most of them stayed in the warmer sub-pools, so you had plenty of peace and space to swim a few lengths. As I’m not a great swimmer, this was appreciated. As Habiba doesn’t like people getting in her way, I’m sure she appreciated it, as well. On our second day off, the following weekend, we hitchhiked to a waterfall about twenty kilometres south of Vallanes. 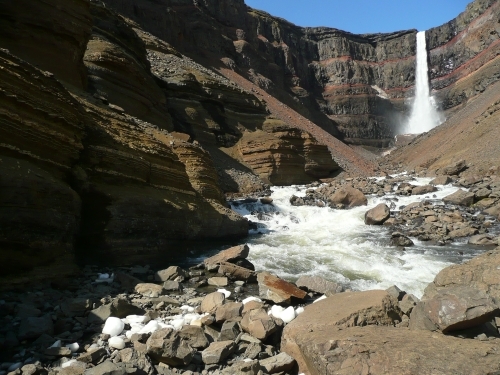 We walked to the main road and set off in the direction of Hengifoss. I’d never hitchhiked before and was wary of what the experience might bring. Before too long, however, a woman pulled over in her four-wheel-drive and invited us to get in. She turned out to be a friend of Eymundr, the Vallanes farmer. The walk up to the waterfall was a moderately strenuous, but short hike. We lengthened it by taking lots of photos. Before the main fall, there were a couple of other points of interest to take in. 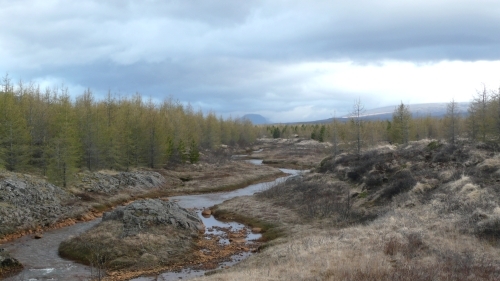 The river was fed by Iceland’s biggest glacier, Vatnajökull and tipped over the edge of a long, flat, ridge, carving a gorge on its way to a long, narrow lake that was very close to Vallanes further north. 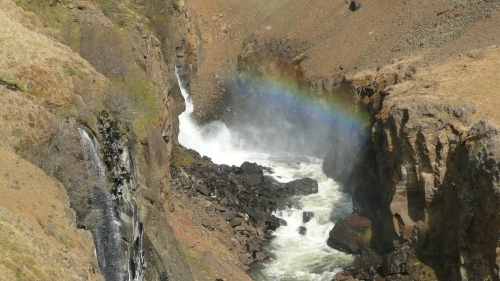 The first point of interest was a twist in the gorge where the water thundered through and the resultant spray made a rainbow in the sunlight. 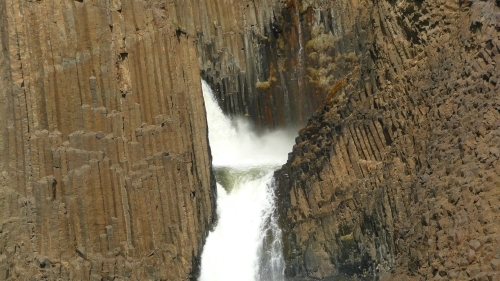 The second point of interest was a part where the walls of the gorge had the geometric form of lava columns – like the Giant’s Causeway in Northern Ireland. And then Hengifoss itself was a tall pillar of water spewing over the edge of a cliff into a great cul-de-sac lined with various strata of rock. We were pretty optimistic about hitchhiking back to the farm and we set out, crossing the causeway-bridge combination across the lake and along the road we’d come down. It was about an hour and a half and a couple of dozen vehicles later that we were finally picked up – by the same woman who’d taken us to the waterfall earlier. She dropped us right back at the farm, stopping for a minute to say hello to Eymundr (who was dressed in nothing but shorts and boots). The two weeks on the farm went by pretty quickly – and it was a very pleasant experience. We had fun hanging out with the other volunteers – especially Habiba, being rather more sociable than me. The sun bothered me a bit; I took to using a kerchief-bandanna thing I found in the communal wardrobe to protect my neck and ears – combined with my green cap, it made me look like a WWII Japanese soldier (I decided to keep this when we left). The second week got a bit boring for me, and I became somewhat withdrawn – I missed having my own space and privacy. I took to listening to Fear Factory to counteract the organic, touchy-feely, hippy goodness of it all – especially the kind of music people listened to and played (Digimortal is a fantastic album, it turns out). I’m glad that I had Habiba there as my connection to humanity. There were some other very quiet characters at the farm and I could imagine how lonely they probably were. At the end of our fortnight of farming for a few days of travel and sightseeing in Iceland – which will be the subject of my next post.